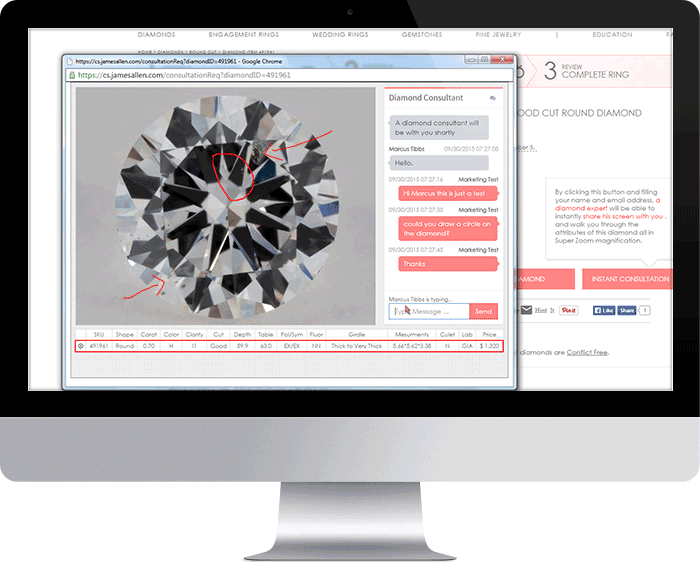 Check out our walkthrough video above on how to use the Real Time Diamond Consultation. Our diamond experts are available 24/7, so feel free to get in touch at a time convenient for you. James Allen brings you the first ever Real Time Diamond Consultation, where you can browse diamonds instantly alongside one of our non-commissioned diamond and jewelry experts. Ask questions, mark points of interest on the diamond itself and review everything from the specs to the grading certificate together. Our non-commissioned diamond and jewelry consultants are available for you 24/7. No scheduling. No fancy software. Just you and your diamond consultant, telling you everything you need to know. Make notes, draw, and spin diamonds on the screen, all while chatting with your diamond expert in real-time. View the full specs of each diamond together with your diamond consultant, and even compare multiple diamonds simultaneously. Inspect the diamond’s grading report together with your diamond consultant, going over any questions along the way. Real Time Diamond Consultations are currently available on desktop and tablet. We do not support mobile access at this time.